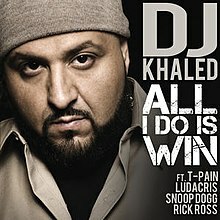 "All I Do Is Win" is a song from DJ Khaled's fourth studio album Victory (2010). It was the second single from the album. The track features American rappers T-Pain, Ludacris, Snoop Dogg and Rick Ross. It was released on February 8, 2010, along with "Put Your Hands Up". The single was certified 3× Platinum by the RIAA. It was the only Billboard Hot 100 charting single from the album. (2010) "Welcome to My Hood"
(2010) "Pullin' on Her Hair"
The music video debuted on BET's 106 and Park on March 3, 2010, along with the video for "Put Your Hands Up". It pictures DJ Khaled with his BET Awards and is filmed mostly against a green screen, also featuring a scene of his appearance at the 2008 BET Hip-Hop Awards show accepting an award for his song "I'm So Hood (Remix)". A video for the official remix was shot in Florida. The video was directed by Dayo & Gil Green. Photos of the shoot were also leaked online. The video features cameos from Nicki Minaj, Fabolous, Fat Joe, Jadakiss, Puff Daddy, Ace Hood, Cam'Ron and Busta Rhymes. A behind-the-scenes video was released on June 2, 2010. The remix's music video was released on June 29, 2010. On April 28, 2010, the official remix was released. It features Rick Ross, Busta Rhymes, Diddy, Nicki Minaj, Fabolous, Jadakiss, Fat Joe, Swizz Beatz on background vocals, and T-Pain. Jadakiss's verse is a sample from "Allergic to Losing", a song from his 2010 mixtape The Champ Is Here 3. The remix was released as a digital single on iTunes on June 8, 2010. A music video has been shot and was released on June 29, 2010. DJ Khaled also raps a verse on the remix. There is another remix titled "Hood Remix" or "G-Mix" which is by Nappy Boy artist Young Cash. The remix features a new rap line up, Yo Gotti, Gudda Gudda, Bun B, Ice Berg, 2 Chainz, T-Pain, and Field Mob. On this version, instead of T-Pain on the chorus, Young Cash is, while T-Pain delivers a verse of his own. The song has become an anthem for numerous sports teams, most notably the Auburn Tigers football team during their 2010 national championship season. It was played during the team's pregame entrance video as well as following each home victory in Jordan–Hare Stadium. The New York Knicks professional basketball team also use an instrumental version of the song for their player intros during the 2010–11 NBA season. The Denver Nuggets, Memphis Grizzlies, Indiana Pacers, Portland Trail Blazers, Cleveland Cavaliers, Carolina Panthers, Nashville Predators, and Phoenix Suns play this song after every home game victory. The song has gained popularity among Miami Hurricanes football fans as Snoop Dogg's line "We like the U in the 80s" refers to the University of Miami football team that dominated college football in the 80s and early 90s. It was subsequently arranged for the Band of the Hour, Miami's marching band. Internet mashup artist DJ Earworm has included the song in a mash-up designed for the 2012 Summer Olympics. A remix version was made in December 2011 for Tim Tebow of the Denver Broncos, called "All He Does Is Win" – the video went viral on YouTube. The New Orleans Saints play the chorus of "All I Do Is Win" during home games. This is also one of themes for the Canadian roller derby team, E-Ville Roller Derby. The song was used as background music for one of the commercials advertising the Jamaican teen magazine television programme Teen Seen, which aired on major television network CVM Television on Saturdays at 6pm (previously at 4:30pm) and was created by the National Family Planning Board (which produced the programme with Phase 3 Productions). At the 2013 White House Correspondents' Dinner, President Barack Obama was introduced to "Hail to the Chief," which quickly cut to a snippet of "All I Do is Win." On April 28, 2014, actress Emma Stone lip synched the song in a "Lip Sync Battle" against late-night talk show host Jimmy Fallon. The song was featured in the 2015 musical comedy film Pitch Perfect 2, the 2015 film Magic Mike XXL, and the 2016 R-Rated comedy "The Boss". The song was also used in the trailer for the 2015 film The Peanuts Movie. This song is also featured on the soundtrack for NBA 2K16. The YouTube channel Barack's Dubs created and uploaded a mashup video of U.S. President Donald Trump singing the song. This song is referenced on one of the "Coke and a Song" bottles and cans available as of Summer 2016. The song is featured in a Classico Pasta Sauce commercial that debuted in mid-late 2016. The song debuted on the Billboard Hot 100 at No. 63 chart date of March 6, 2010, and peaked at this chart at No. 24 for the chart dated July 24, 2010. It also peaked at No. 8 on Hot R&B/Hip-Hop Songs in 2010. The song was certified double Platinum by RIAA on July 6, 2011, and 3× Platinum on 19 June 2015. The song re-entered the Hot R&B/Hip-Hop Songs chart in May 2014 at No. 23. As of May 2014, the song has sold over 3 million copies in the US. The song debuted on the Canadian Hot 100 chart at No. 69 for the chart date of March 6, 2010. ^ a b "All I Do Is Win (feat. T-Pain, Ludacris, Snoop Dogg, Nicki Minaj & Rick Ross) - Single by DJ Khaled - Download All I Do Is Win (feat. T-Pain, Ludacris, Snoop Dogg & Rick Ross) - Single on iTunes". Itunes.apple.com. February 9, 2010. Archived from the original on March 7, 2011. Retrieved February 26, 2011. ^ "DJ Khaled / Ludacris / Rick Ross / Snoop Dogg / T-Pain All I Do Is Win". Allmusic. Retrieved August 4, 2014. ^ a b c "American single certifications – DJ Khaled – All I Do Is Win". Recording Industry Association of America. Retrieved May 7, 2014. If necessary, click Advanced, then click Format, then select Single, then click SEARCH. ^ Nigel D. "All I Do Is Win Remix Video Shoot". Realtalkny.uproxx.com. Archived from the original on July 16, 2012. Retrieved December 10, 2011. ^ "Video: Behind The Scenes of DJ Khaled "All I Do Is Win" ft. Rick Ross, Busta Rhymes, Diddy, Nicki Minaj, Fabolous, Jadakiss & Fat Joe. | News | Rick Ross | Artists | Def Jam". Island Def Jam. Retrieved February 26, 2011. ^ a b "All I Do Is Win (Remix) [feat. T-Pain, Diddy, Nicki Minaj, Rick Ross, Busta Rhymes, Fabolous, Jadakiss, Fat Joe & Swizz Beatz] - Single by DJ Khaled - Download All I Do Is Win (Remix) [feat. T-Pain, Diddy, Nicki Minaj, Rick Ross, Busta Rhymes, Fabolous, Jadakiss, Fat Joe & Swizz Beatz] - Single on iTunes". Itunes.apple.com. June 8, 2010. Archived from the original on February 22, 2011. Retrieved February 26, 2011. ^ "KNICKS: Knicks Mix - 12/22/2010". Nba.com. December 22, 2010. Retrieved February 26, 2011. ^ Carley, Brennan (July 10, 2012). "DJ Earworm Building Beats For Summer Olympic Games". Billboard.com. Retrieved December 29, 2013. ^ Adams, Erik (August 8, 2013). "The 2012 Summer Olympics: August 7, 2012". AVClub.com. Retrieved December 29, 2013. ^ Chappell, Bill (April 28, 2013). "Obama And O'Brien Take Jabs At Politics And Media (Highlights)". The Two-Way. NPR. Retrieved April 28, 2013. ^ C-SPAN (April 27, 2013). "President Obama at 2013 White House Correspondents' Dinner (C-SPAN)". Retrieved April 28, 2013. ^ Waxman, Olvia B. (April 28, 2014). "WATCH: Emma Stone and Jimmy Fallon Face Off in Epic Lip Sync Battle". Time. Retrieved April 29, 2014. ^ Donald Trump Singing All I Do Is Win by DJ Khaled. YouTube. May 23, 2016. ^ Classico Pasta Sauce. Vimeo. September 2016. ^ a b Emily White (May 8, 2014). "Ray LaMontagne's 'Supernova' Shines At No. 1 On Top Rock Albums Chart". Billboard. ^ Grein, Paul (May 7, 2014). "Chart Watch: John Legend Wins A Squeaker". Yahoo! Music. Yahoo!. ^ "Hot 100 Songs : Apr 22, 2013 - (Chart position) | Billboard Chart Archive". Billboard.com. Retrieved April 22, 2013. ^ "Canadian single certifications – Dj Khaled – All I Do Is Win". Music Canada.